Ever wondered what 10,000 pound coins look like? The immediate answer is not very much. Walking into the main space at the Bush Theatre, configured as a gameshow set complete with flashing lights and garish set decoration, the pile of shiny gold items is disappointingly and surprisingly small. While this underwhelming realisation might not be the intended effect of placing so much cash on stage, it does have a fitting resonance with the performance of money in our society. Like the illusion of theatre, it relies on us believing in it, accepting one thing as standing for another. Except the idea represented by money is a hollow one, divorced even from the gold that the coins’ shiny surface suggests – a sign with nothing behind it, empty simulacra. We’re in the desert of the real and everything is up for grabs. 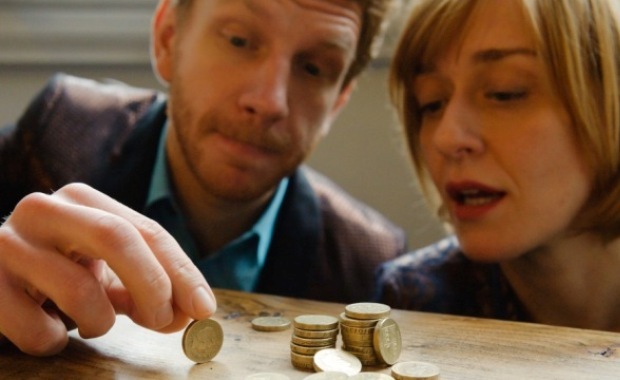 The function of the cash on stage in Clare Duffy’s show is to explain the financial crash of 2008, with a little help from two hedge fund managers turned performance artists. Queenie and Casino, played by the brilliant Lucy Ellinson and Brian Ferguson, split the audience into two teams and pit us against each other, playing games and placing bets in a bid to win the pile of coins; games fittingly involving bubbles and balloons teach us about long and short bets, dramatising with the help of audience members the culture of risk that led to financial collapse. The other and arguably more powerful effect of these games is to draw us into the adrenaline-fuelled thrill of the trading floor, injecting us with the giddy exhilaration that drives bankers, gamblers and gameshow contestants alike. Between these games, short scenes narrate the story of Queenie and Casino’s own involvement in the financial crisis, a bursting of the bubble that, far from avoiding, they actually placed a high-stakes bet on taking place. In contrast with the alienating jargon that excludes many from an understanding of financial operations, the games devised by Duffy are pointedly accessible and quickly recognisable, evoking the playground more than the trading floor. Players shout and laugh in excitement, the audience whoops and jeers, Queenie and Casino bicker and tease. This childishness is visually reinforced at every turn, surrounded by bubbles and balloons, buckets and spades. The implication is perhaps that there is something immature and stunted about this way of playing with money, or maybe it is a game that has a primitive appeal to all of us. The riotous fun that is encouraged, however, threatens to undo its own work; as soon as the experience becomes too game-like, the sensation that all this risk-taking is ‘just playing’ becomes once again perpetuated, distancing us from a crisis that we can therefore dismiss. Similarly, the doubled performance of money, while making these signifiers strangely unfamiliar, also runs the risk of departing so far from the real that it can be consigned simply to fiction. The further we feel from what the money represents, the more we think – like the traders – that what we do with it doesn’t have real effects. It is this flirtation with the performative function of money, however, that is one of the most fascinating aspects of the production. As Queenie and Casino repeatedly assert, money is founded on belief, on faith. But what happens to that belief in a theatre environment? What happens when a mimetic act is folded over on itself? Reflecting on the performance, it suddenly occurs to me that coin is an anagram of icon, with all its connotations of belief and worship but also a suggestion of something ultimately empty, a shiny surface concealing nothing beneath. It’s the exposure of this concealment that the show partly enacts, a stripping away of our socialised belief in money, but by the end the sheen is beginning to return. The final portion of the show, once the games have been played and the fate of Queenie and Casino decided by which of their teams wins (Queenie’s – my team – on the night I went), there is a jolting gear change. Suddenly plunging us into the bleak reality of our zombie economy, accompanied by an abrupt shift from the flashing lights of the gameshow to a row of stark, blinking fluorescent strips, the piece changes track so rapidly that it’s possible to be derailed. There is a hovering moment at which the audience lurches uncertainly between smiling humour and a tentative suspicion that this is meant to be taken seriously. And it is horribly, gut-twistingly serious. The conclusion, unravelling slightly, but aptly so, reminds us of the situation that we push to the back of our minds, that we paste over with stories and a stubborn belief in shiny, worthless objects. It’s chaotic and terrifying and depressing. As Queenie and Casino dance a dangerous tango, narrating the process of financial collapse as they twist around the stage, they refer to something known as ‘Roadrunner Syndrome’: “when you run off a cliff so fast that you keep on going on just thin air. It’s only when you notice that the ground isn’t there anymore that you fall.” This is what happened at the start of the crash, as banks ploughed on oblivious to the bubble bursting around them. But in many ways I’d suggest that we’re still treading that thin air, supporting ourselves on a slim but persistent belief in the mimetic structures of money. This production might make us glance down for a moment, maybe drop a couple of feet with a lurch of the stomach, but we don’t quite hit the levelling ground.